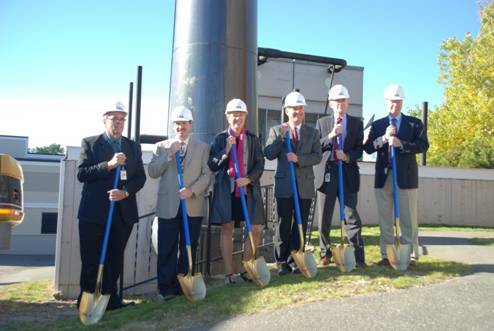 The Aroostook Medical Center held a ground breaking for its innovative compressed natural gas heating conversion project on Thursday, Oct. 25, 2012. Participating in the event were (left to right) James McKenney, TAMC vice president for diagnostic and support services; Tim Doak, TAMC facility engineer; Sylvia Getman, TAMC president and CEO; Gene Lynch, vice chair of the TAMC Board of Trustees; Brian Doyle, the Governors account executive for Aroostook County in the Department of Economic and Community Development; and Bob Dorsey, president and CEO of the Aroostook Partnership for Progress. Compressed natural gas is a form of natural gas that is stored under high pressure. It is one of the cleanest and safest fuels available. The hospital broke ground on the project during a brief ceremony on Thursday. Once the project is completed in April 2013, TAMC leaders said that the health care organization will save an estimated $400,000 to $500,000 in annual heating costs at its largest facility – A.R. Gould Memorial Hospital on Academy Street in Presque Isle. Sylvia Getman, president and CEO of the hospital, said on Friday that she sees the conversion effort as something that will benefit the hospital and the environment and possibly have far-reaching effects across the state. According to Getman, the hospital organized a committee last year to brainstorm ideas that would help them save money on operational costs. Officials at TAMC immediately zeroed in on annual spending to heat the buildings on campus. James McKenney, TAMC vice president for diagnostic and support services, said that officials briefly explored heating with biomass, but soon decided that it did not make good financial sense. The first phase of the project involves the laying of the pipeline that will connect the docking station to the boiler plant. Earth-moving equipment is now on site at the far south end of the hospital property in an area that until recently was used as a parking lot. Soderberg Construction, a Caribou contractor, is preparing the site for a decompression station where, once up and running, tube trailers filled with CNG will be connected. The decompression station will lower the pressure and transfer the gas into an underground pipeline, which will run along the eastern boundary of the hospital property and cross a parking lot to connect with and feed the existing boiler plant. The existing burners on TAMC’s boilers can burn CNG with only minor modification, and will also be able to burn No. 2 heating oil as a backup fuel. McKenney said that the low start-up costs for the CNG conversion and the stable natural gas market made it the most logical choice. He said that this conversion could lead the hospital to choose forms of alternative energy to heat its other facilities throughout central Aroostook County. He also said that TAMC intends to expand how it uses CNG in the future to include powering the hospital’s air conditioning, clothes dryers and cooking ovens. Currently, the hospital uses fuel oil to both heat and cool the facility. Tim Doak, TAMC facility engineer, serves on the alternative energy committee composed of staff and members of the TAMC Board of Trustees. Doak designed the site and led the effort to obtain the necessary environmental permitting to allow construction of the site to begin. That effort to seek state approval for such projects was supported by the Aroostook Partnership for Progress, who formed a working group to champion this cause and tackle the barriers and rules implementation with the state. The group worked with the governor’s energy office, the Maine Public Utilities Commission, Fuels Board and Fire Marshall to finalize the natural gas operating parameters and eliminate the permitting obstacles. Bob Dorsey, president and CEO of APP, said that he considered it an “incredible accomplishment” that TAMC had worked with various team members and secured the go-ahead for natural gas use in the County in just three months. Both McKenney and Getman said that other health care facilities and organizations across the state have contacted them to discuss the project. They said that they are pleased that other facilities are watching their CNG conversion project and are optimistic about the possibility of other such projects across the state. XNG will be the first company in Maine to haul CNG for heating use, and will provide the trailers, decompression station, CNG, and do all of the hauling. The hospital’s supply of CNG will come from the northeastern United States. XNG trucks with tube trailers will transport the fuel from a new CNG compression station being built in Baileyville in Washington County. When a truck arrives, it will connect to the decompression station and the tube trailer will remain on site until the tank is empty. At that point, another trailer will be trucked to the site to take its place. Several trailers of fuel will be delivered each month. The cylindrical trailers used to transport CNG must meet very stringent safety standards. They are designed to survive a rollover at highway speeds without rupturing. The trucks hauling CNG to TAMC will use the Centerline and Easton roads to access the hospital, thus avoiding the heavy traffic and sharp turn onto Academy Street in downtown Presque Isle.